A Misson falls and a town rises. 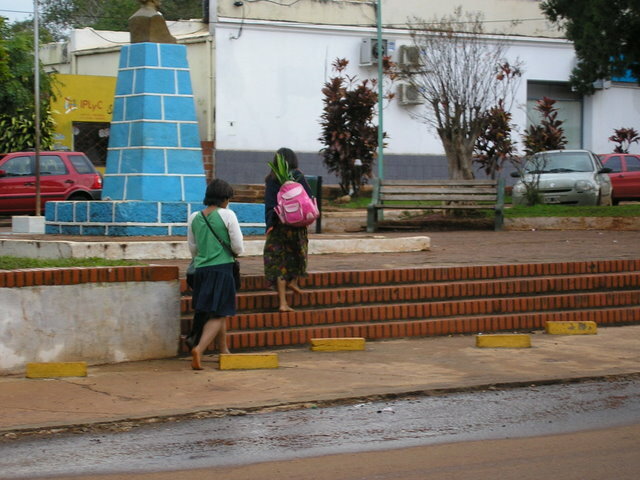 A four-hour bus ride south of Iguazu on Route 12, and several miles in from the highway within sight of the Rio Parana, is the village of San Ignacio. 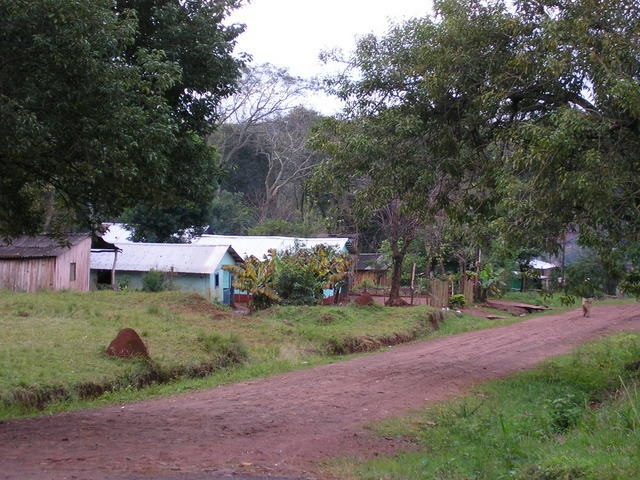 Like Puerto Iguazu - although considerably smaller - the town probably would not exist if it wasn't for the ruins of the great Jesuit mission, San Ignacio Mini. A UNESCO World Heritage site, it attracts thousands of tourist each year. Unlike more industrious Argentine towns, San Ignacio seems like a quintessential laid-back South American village in another era. More than half the population are Guarani engaged in the crafts of weaving, basketry, pottery making and wood carving that has been carried on for ages. Craft stalls line the wall of the old mission and dozens of shoeless children will ask the obviously well-off tourists for cambio (change) or offer small pieces of wrapped candy, pencils, etc. for sale. At night the silence of the surrounding rural countryside lays over the town like a soft moist blanket. The winter rainy season (July/August) means frequent drizzles and showers, but also fewer tourist. It also means pleasant, if damp, temperatures in the 60's and 70's (F), rather than the 90's of the tourist summer. Although we came, like everyone else, to see San Ignacio Mini, we were surprised to discover that the town was the long-time home to the famous, eccentric and tragic Uruguay/Argentine artist and writer Horacio Quiroga whose house is preserved as a museum. There are a number of small inns and hotels in town, few that are particularly special but all are inexpensive. We chose the quite acceptable Hotel San Ignacio. 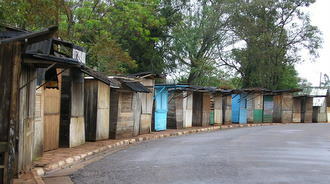 Two nice looking hostels are also in town, one affiliated with Hostelling International. Of the dozen or so restaurants, again none that are special, Restaurant Don Valentine and Restaurant Playa Azul were adequate. After visiting the mission and the Casa de Horacio Quiroga there really is not anything to do in town except hike into the countryside but, although you can make San Ignacio a day trip from the city of Posadas, just a one-hour bus ride further south west, we preferred to spend the night in this small quiet village - and gamble in its Casino! Casinos are to be found in many towns in Argentina but this was the first I had ever seen in a village this small, complete with flashing lights, a stylish tall white building, and large fountain. The spotless interior and pleasant personnel made me wonder why this was the one and only casino I had entered in all of Argentina - except that I really do not enjoy gambling. We actually went in twice and each time came out a couple bucks ahead. Don Valentine and Restaurant Playa Azul are directly opposite the mission and, like most of San Ignacio's restaurants, cater to bus tours. Interior space is lined with very long tables. Restaurant Don Valentine has a small outdoor eating area that provides a nice view of the Museo Jesuítico de San Ignacio Mini. Its menu is traditional Italian-Argentine with decent pastas as well as burgers, ham and cheese sandwiches and salads. Don Valentine himself is a pleasant gentleman who enjoys talking with his guests. Prices are inexpensive and lunch for two averages AR$40 ($10.50). Restaurant Playa Azul is a large, air-conditioned space with a pleasant garden of which some tables have a view. 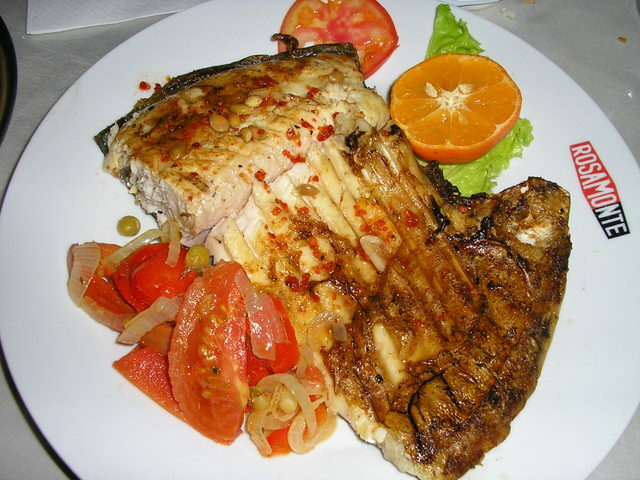 In addition to the standard fare, they do serve well grilled fish dishes. Lunch for two will average AR$100 (US$27.00). Centrally located on the main street of San Martin - only a half dozen blocks to the mission and two blocks to the Casino the - Hotel San Ignacio is a better choice then the dubious structures we saw near the Mission. It has standard motel-type rooms as well as A-frame bungalows with 2 bedrooms, all surrounding two very attractive landscaped gardens. I suppose because it was off-season, we were given a bungalow. Due to the high humidity in Missiones Provence, the rooms are a bit musty but heat pumps helped to clear the air within a few hours. The lobby area is nondescript but that is where the computers are located - no Wi-Fi connection. The hotel operates one of the few internet cafes in San Ignacio so use of the computers was not free for guests. The computers were dinosaurs and the connection painfully slow. A breakfast of bread & coffee was also extra. Our bungalow was AR$110 (US$29.00). 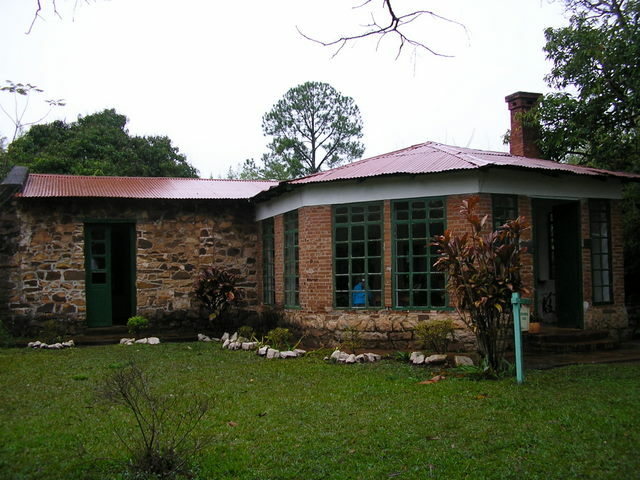 The brilliant, eccentric, self-absorbed, tragic life of Uruguay born Argentine artist, writer and farmer, Horacio Quiroga (1878 - 1937) is immortalized in his San Ignacio home a couple of dirt road miles outside of town (take a taxi and the driver will wait for you.) 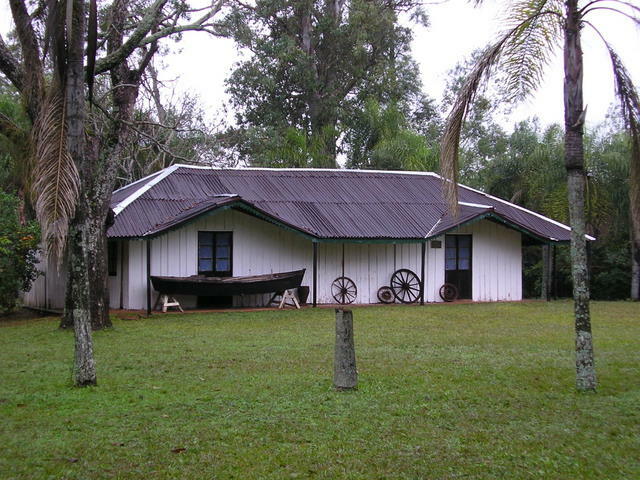 While the intelligentsia of Argentina were extolling the intellectual vitality of the cities, Quiroga chose one of the poorest rural areas of the country to establish a 400 acre farm overlooking the Parana River in 1910. 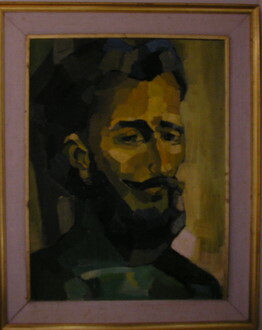 The income from cotton farming and a series of low level civil servant positions, along with rural solitude, provided Quiroga the artistic freedom to paint and write poetry, novels and philosophy in a style considered too avant-garde for even the sophisticated society of Buenos Aires - although he did enjoy literary fame the last ten years of his life. Today he is recognized as a key figure in the artistic Renaissance of pre-World War II Argentina. He constructed his first house and a swimming pool in 1910, but after the suicide of his first wife in 1917 he filled the pool with snakes. He constructed a second, larger house in 1931 in which he lived until his own suicide in 1937 - after being diagnosed with cancer. This second home is now a museum with 1930s furniture, photographs of his life, personal belongings and artwork. A replica of his first house stands nearby. 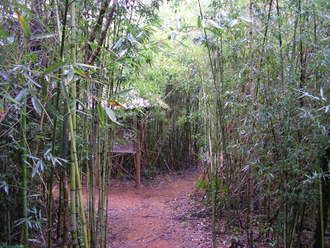 There is a fascinating serpentine walk through a huge stand of bamboo with stops that recount both his life and his philosophy. Casa de Horacio Quiroga is open 7:00 AM to dusk, Thursday through Sunday. Admission AR$5 (US$1.35). A round trip taxi will cost AR$25 (US$6.50). It is well worth a visit.